Center for Digital Development Director Chris Burns, and Foundation for Food and Agriculture Research COO Julie Reynes with Grand Prize Winners Adam Wills and Georgia Barrie of Farm.ink at the AfricaCom awards ceremony. Photo credit: KNect365. In a room of 20 teams buzzing with anticipation over whether they won one of the six awards, the question, “Did we do a good job?” was top of everyone’s mind. But it wasn’t simply competitors wrestling with that question in our focus groups and interviews. The team behind the Fall Armyworm Tech Prize wondered the same thing. Did we clearly communicate our objectives, process, and incentives, allowing competitors to assess whether participating was appropriate for their organizations? Prize winners, unsurprisingly, assured us that competing was worth it. Notably, they explained that they entered the competition because the prize matched their strategic interests, so even if they lost, the experience would still be worthwhile. For Grand Prize winner Farm.ink and Runners-Up Akorion and Project Concern International (PCI), in partnership with Dimagi, competing not only allowed them to respond to growing customer demand for innovative solutions to address the destructive pest, it also incentivized them to respond to that demand in a way that reflected their organizations’ strategic goals. 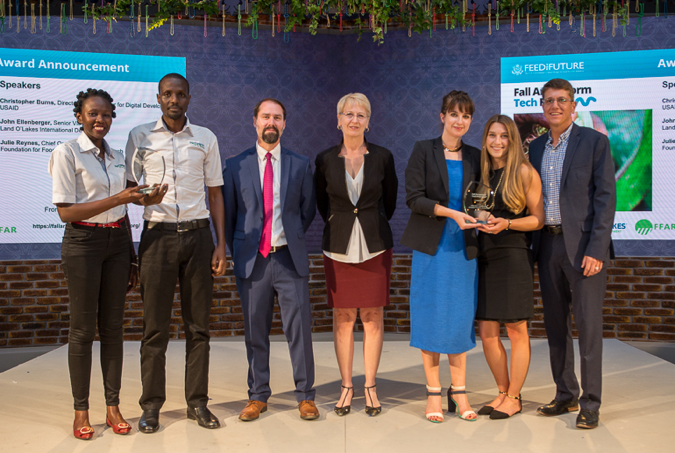 The second place teams, Akorion (on the left, Zilla Mary Arach and Richard Nuwenyesiga) and PCI and Dimagi team (on the right, Delphine Pedeboy, Jennifer Waugaman, and Nick Ford) with USAID Center for Digital Development Director Chris Burns, and Foundation for Food and Agriculture Research COO Julie Reynes at the AfricaCom awards ceremony. Photo credit: KNect365. While Farm.ink, Akorion, and PCI all approached the Fall Armyworm Tech Prize with slightly different models, they all entered the competition because it offered a unique opportunity to respond to customer demand. In PCI’s case, addressing fall armyworm started at the field level. Two large PCI projects, in Malawi and Tanzania, were experiencing significant crop losses as a result of the pest and feared more losses were inevitable. The prize provided flexible funding for the home office and project staff to experiment with new approaches to tackle the problem. The team leveraged their current programs to adapt existing tools and solicit smallholder farmer feedback. PCI found the prize process advantageous because in a relatively short amount of time they were incentivized to use project resources to pilot the technology and validate it. PCI now has the ability to use the prize results as leverage to pursue other opportunities the organization may not have otherwise considered due to funding restrictions or a previous lack of evidence. 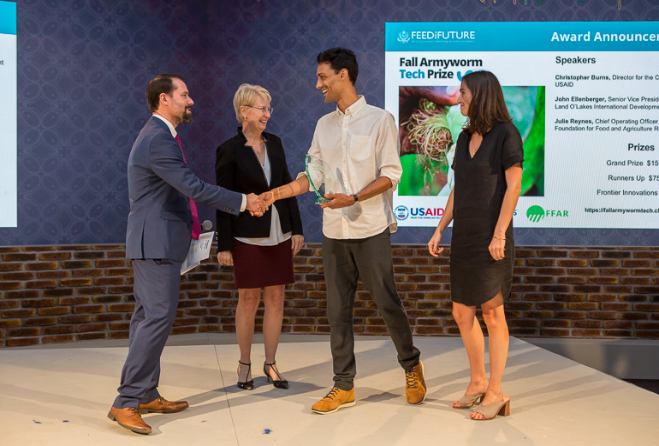 Participating in the Fall Armyworm Tech Prize allowed our winners to pursue strategic opportunities in ways that met their organizational goals. Akorion’s Zilla explained that Akorion had recently conducted a market scan of new functionalities to develop for the firm’s winning EzyAgric app, which aids farmers in easily geo-mapping their plots and getting accurate acreage instantly, managing their farm records and planning, as well as buying genuine inputs from the app. After researching the value of artificial intelligence (AI) and chatbots, Zilla settled “on incorporating AI and the prize accelerated Akorion’s strategy to use AI in service delivery in EzyAgric.” Furthermore, simultaneous with the prize, Zilla noted that Akorion “joined the Google developer Launchpad, which also provided us with an opportunity to perfect our AI.” As a result, Akorion is now one year ahead of schedule and moving into the AI space faster than anticipated. In the case of Dimagi, the organization partnered with PCI because as Delphine Pedeboy, a Dimagi business development associate, explained, the firm saw the prize as “a great opportunity to pursue more agriculture projects.” Dimagi is the creator of CommCare, a platform that supports collecting and analyzing data. To date, the platform has a well-known track record in the health and logistics sector. While Dimagi previously pursued agricultural applications of CommCare, joining with PCI to apply CommCare to integrated pest management efforts offered an opportunity to highlight the versatility of the platform outside of health and logistics. For all of international development’s optimism—believing that through smart investments, technology, programs and partnerships, we can ensure food security, eradicate disease, foster gender equality, and put countries on a path toward lasting self-reliance—there’s a ruthlessness in prizes. As prize sponsors, we have a responsibility to design prizes that catalyze weak markets without distorting them. Once we’re assured of our prize’s potential role in a system, the onus is on prize sponsors to clearly communicate our objectives, criteria, and incentives so that competitors can assess whether the opportunity is right for them. In exchange, we encourage competitors to ask themselves whether competing is in their best interest as well. While highlighting the experiences of the winners doesn’t answer the question of whether competing in the prize is worth it for all competitors, it is clear that these opportunities are most beneficial to participants who saw the competition’s objectives as an opportunity to pursue strategic interests, allowing them to meet their organizational goals and customer demand. For them, this investment meant that, win or lose, the prize would leave them—and African farmers—in a better position to combat fall armyworm than before we started. Meredith Perry was the Program Manager on DAI’s Center for Development Innovation project and one of the technical advisors on the Fall Armyworm Tech Prize. The prize is managed by DAI’s Digital Frontiers project and implemented by the Nesta Challenge Prize Centre.